Clay roofing tiles or Terra cotta tiles. An introduction. The oldest form of a permanent roofing material, clay roofing tiles have the potential to last several lifetimes. The longest lasting roofing material has the history to prove it. Clay roofing tiles - Mission or barrel roof tiles. The photo above of some terra cotta roof tiles that at a guess would be at least 200 years old. It can be used to illustrate a few important points about this most resilient of materials. The photo was taken in the historical town of Dubrovnik, a UNESCO World Heritage listed city on the Adriatic Sea in Southern Croatia. Why on earth has this city gained this World Heritage status? Well it is not hard to guess, knowing that the subject of this page is clay tiles. I use the phrase terra cotta here on purpose as it is the local term for these tiles. For hundreds of years the buildings of this and other old cities have been protected by terra cotta roofing tiles. Cities that used less durable materials have either changed completely or have simply disappeared. The shores of the Northern Mediterranean spawned western civilisation and the architecture, building materials and methods that were pioneered in those early days have been taken up and improved by the manufactures today. 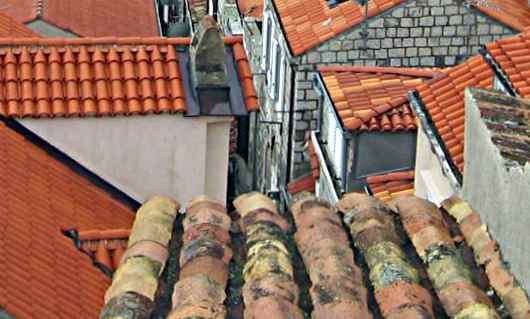 Clay roofing tiles - Another shot of roofs in Dubrovnik. Here you can clearly see old Roman era tiles in the foreground and in the upper left you can see a roof that has been renovated with modern tiles. Photo thanks to User:Neoneo13, Wikipedia. 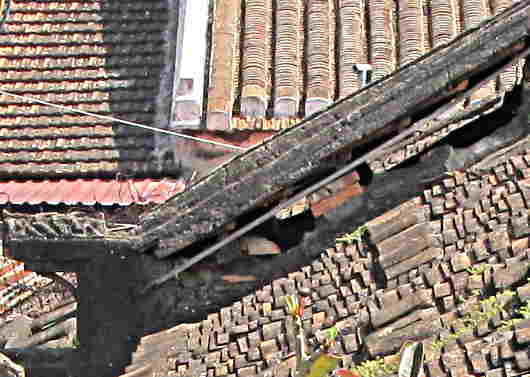 Clay roofing tiles - A mixture of roofs in Hoi An, Vietnam. Hundreds of years old "Ying and Yang" tiles along with some more modern ones and a touch of ubiquitous steel roofing. Above is a rather scrappy photo of some roofs in Hoi An, which is also a UNESCO World heritage listed city. Funny that eh? Two in a row and both use clay tiles. I wonder if they will ever list one with fibreglass shingles? All the tiles are just about the same, being about 10mm thick and 200 long and shaped like a shallow semicircle. The tiles are laid in alternate rows concave and convex. 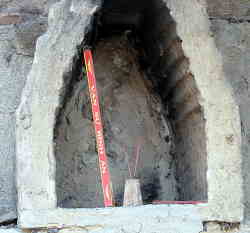 The jointing material is lime mortar. It is remarkable that two civilizations evolving separately at the same very early period of human history would come up with the same answer to to this complex problem. How clay tiles have been made for centuries. Clay roofing tiles - A beehive shaped kiln, one of many in the Mekong Delta region of Vietnam is making bricks and roof tiles in exactly the same way that that they have been made for centuries. On a recent trip to Vietnam I was privileged to be able to wander around a brick and tile works that uses technology almost unchanged for hundreds of years. Sat on a bank of one of the branches of the Mekong it was supplied by barge and sent it's products by barge. All loaded and unloaded by hand. There were no fork lift trucks, but hand carts and baskets on bamboo poles. The clay came from close by and so did the fuel for the kilns, rice husks. Areas where clay tiles (and bricks) are made are always situated close by deposits to deposits of natural clay. The clay is dug out of the ground and mixed with water to a dense malleable consistency. Any air bubbles are removed in this process. The tiles are either pressed into moulds or extruded and cut to length and placed in a position to dry for some days, possibly a week or more. When the tiles are leather hard they are stacked inside the kilns. The kilns are sealed up, apart from a vent at the top and the fire hearth. The kilns are fired. That is a combustible material, usually wood but in the case above rice chaff is ignited and a constant source of heat is maintained for the duration of the fireing period. The clay undergoes a change of it's chemical composition during the firing process. 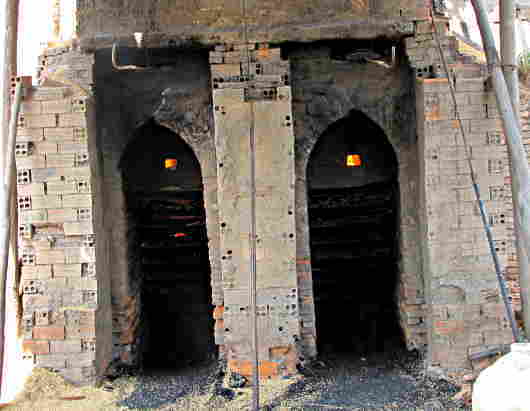 When the fireing is complete, around a week, the kiln is allowed to cool down slowly. Probably another week. The tiles are removed and stacked. They are allowed to age for a period before use. clay roofing tiles - The firing is under way here and these are the hearths where to fuel is consumed. There is a hopper containing the fuel over the hearths and it is adjusted to allow the correct amount of fuel trickle down into the hearth. The whole of this work is done by unskilled labour apart from one or two highly skilled kiln masters. 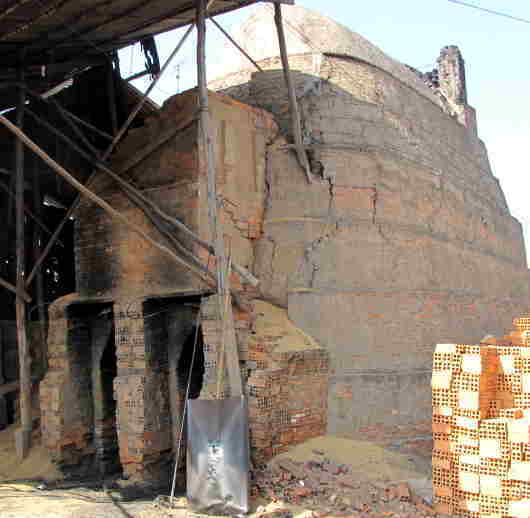 The knowledge of generations is needed to finely judge the the composition of the clay, the temperature of the kiln and the duration of the firing and cooling processes. 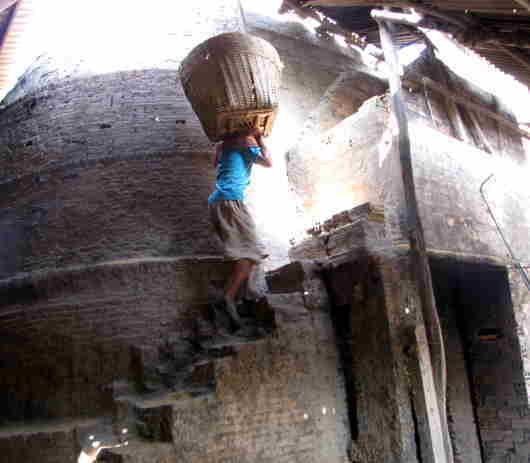 Clay roofing tiles - The firing is underway and the hopper has to be loaded with rice chaff. This is an ongoing process, 24 hours a day until the firing is complete. clay roofing tiles - Joss sticks. Funny enough, I recognised the packet of joss sticks as coming from a place just a few miles down the road from the tile works. I had been invited inside when I showed some curiosity in the things drying by the roadside, and I met a young guy who was actually making them. Define: Terra Cotta. An Italian term meaning baked earth. From a similar Latin phrase Terra cocta. In general the links on this page are to fairly detailed pages, but don't forget the Illustrated Roofing Glossary Roof Coverings Section as each item has it's separate page with photographs and information. Steel siding , wall cladding.